The Kardon 35mm camera was made c.1945 by the Premier Instrument Co. New York USA. 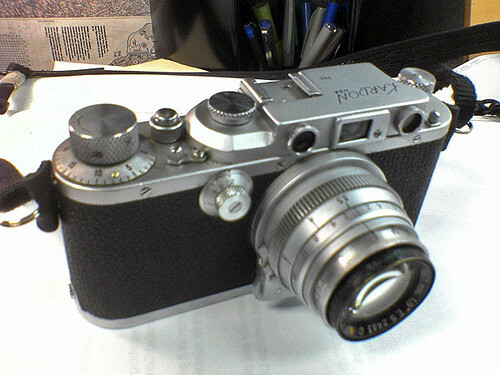 The body is a copy of the Leica IIIa and has a Kodak Ektar f/2 47mm lens. It was made for the US Signal Corps as well as for civilian use. The Signal Corps model has a large nameplate on the back. ↑ McKeown, James M. and Joan C. McKeown's Price Guide to Antique and Classic Cameras, 12th Edition, 2005-2006. USA, Centennial Photo Service, 2004. ISBN 0-931838-40-1 (hardcover). ISBN 0-931838-41-X (softcover). Page 802. The Kardon Camera Story by Jerome Katz, 1975. This page was last edited on 4 December 2014, at 01:41.